“Public engagement” is becoming an expectation of governance at all levels, federal, provincial and municipal. Elections every few years – this year, the 14th of May; learn more at fredvotes.ca – are still the main way we get to give feedback to our leaders, whether through our vote, or throwing our own hat into the ring and getting into office, where everyone will have to hear what you have to say. But at the city level where candidates aren’t part of political parties and don’t propose platforms or policy statements to earn our votes – or don’t even have to campaign because of a lack of candidates, we have other ways to talk about What A City Should Be. Social media is one – of course the City has its own facebook page, where you can get updated on Fredericton services, plus you can show you “Like” what’s new and become a “Friend” of Fredericton. The Mayor and most of City Council have twitter feeds where they and residents go back and forth on important and not-so-important issues. You can get to know Brad Woodside – “Mayor of Fredericton, Doctor of laws STU, Love music, politics, travel, dolphins, Lennon, Laughter and Peace” – and his insights on Fredericton and passing thoughts on the new Brad Burger 2.0 at Relish. But it can be hard to talk about big visions, good ideas or debate substantive policy in 160 characters or less. City Council and standing committees meetings give Frederictonians direct access to decision-makers – and there are plenty to choose from: Council itself, the Planning Advisory Committee, the Riverfront Advisory Committee, the Preservation Review Board, etc. Meeting schedules and agendas are posted on the city website; and when upcoming issues affect a particular street or neighbourhood – like a development proposal going to the Planning Advisory Committee – residents get notice in the mail about what’s going on and where they can present feedback to the committee. But even open meetings are imperfect and can give a false sense of citizen engagement. Standing committee meetings occur on weekdays at noon, excluding Frederictonians who work outside Downtown or unable to take lunchtime off from attending. Agendas for meetings are released on the City website often only the same week of a meeting – and often un-publicised or highlighted – and it can be hard to consider an issue, talk about it with neighbours and compose a feedback presentation in such a short time frame. Of course, engagement is more than just attending a meeting, but the chance to provide constructive and relevant feedback. At City Council, input from residents and experts is often a one-time opportunity to be heard, and councillors and staff have little time to consider public feedback or learn more before voting. In the case of development applications, opportunity for public engagement at committee or Council meetings happens after City staff have reviewed the application and made a recommendation – citizens’ feedback and alternatives aren’t formally part of the staff review process. And when you’re talking about something as complex as a city, there’s often a degree of detail or technicality that escapes the grasp of the layperson, or makes it harder to see how an issue might affect the city as a whole. For example, the Planning Advisory Committee agenda this past 18th of January reviewed details like requests to build house additions or letting a building have a smaller side yard: it can be hard for Frederictonians to engage and paint the big picture of how our city should grow, when the attention of our Councillors, committee members and the public is so narrowly-focused. In other cities, governments actively engage their citizens and give them the information, tools and opportunities they need to participate in decision-making. As opposed to simply reacting to an agenda item after City staff have already written their recommendations and committee members or Councillors are expected to discuss and vote, residents in other cities have their points-of-view included from the very beginning. 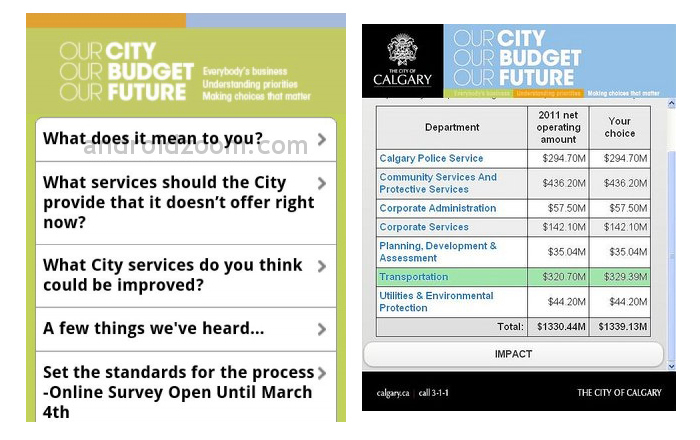 For example, the City of Calgary began its 2012 budget process – Our City. Our Budget. Our Future – by engaging residents about how the budget affects them directly. Their process recognised “emerging issues such as challenges in financial sustainability and growth management, along with a recognized need for improved transparency in decision-making and expectations for citizen engagement”. Calgarians used a Budget Allocator or survey pack that described what each city department does, their detailed budgets, and what an increase or decrease in budget would mean to the services residents received. The entire process was open to the public, so feedback didn’t just go to the City, but to Calgarians as well: ideas could feed on other ideas and get refined along the way. Not only was the City able to prioritise the budget to satisfy the needs of the people, Calgarians also came away better informed about what the city does for them and where their money goes. As well, the City of Regina is empowering its residents through its community plan review process, Design Regina. Using an interactive online tool called MetroQuest, Reginans can get backgrounders and conversation starters on potential issues they face as the city grows, and how prioritising different interests (like public transit, easy car travel, lower taxes, etc) has implications on how Regina turns out in the long run. They also invited expert speakers to kickstart discussion and talk about best practices in other communities, raising expectations amongst Reginans and their City Council when it comes to development and city planning. Finally, the City of Edmonton provides a Planning Academy of classes that help Edmontonians understand the planning and development process, and the roles and responsibilities of the City, developers, citizens and others. Residents who know how the system works are better able to contribute constructively and effectively – and the City listens: there’s a clear policy and standards directing the City to seek out and consider public feedback. What’s more, in partnership with the University of Alberta, Edmonton leads a Centre For Public Involvement that drives research and innovation in citizen engagement, to find the best ways to bring out and apply residents’ ideas. What do you think? Do you feel engaged with Fredericton’s city government? Do you have enough information and opportunity to talk to the mayor and your councillor? How do you tell the City what your priorities are for your neighbourhood and Fredericton in general? Should public consultation be part of City decision-making? What could help you and your neighbours offer more constructive feedback? Better discussion. Better ideas. Better city. This is a really fabulous post about the opportunities and possibilities of talking to people in communities in ways that really matter to them – and make a difference to decision-making. Our team at http://www.dialoguepartners.ca led the work on the City of Calgary budget engagement process noted above, and we also were responsible for the online questioning in the City of Regina. It is nice to see this kind of work showcased as good work, and we’re honoured you think it was a worthwhile example. I tend to think that Advisory and Standing Committees are engagement tools that are about validating or refining almost made decisions – there are so many other ways to gather input to shape those decisions in a way that brings a community together and builds something better than it was before. I love the tag line for your blog – Better discussion. Better ideas. Better city. Enormous possibilities – good luck and keep up the good work! Thanks for your visit and the work you’ve done! It sounds like the consultation process was interesting from your end as well. How did you find it developing buy-in with city governments and citizens into the process? Were cities on-board early on, or did it take some convincing to consider your process as part of their decision-making? Your point about committees being tools to validate rather than to brainstorm ideas is well-put. There’s a time and place for different levels of consultation – for example, public involvement on decisions that mostly depend on existing legislation or expert guidance (eg traffic signalling) may be simply FYIs. Another angle is that, when committees are forced to vote immediately then and there on a topic, or find that their decision-making is constrained to yes/no answers because of process or legislation, or that issues are complicated by technical details, discussion is limited. If committees focused on big-picture policy setting, and delegated details to professional staff, it might improve how public input influences outcomes. What do you think? Are there ways for committees/councils to be restructured so they emphasise work on the big picture rather than get lost trying to micromanage?